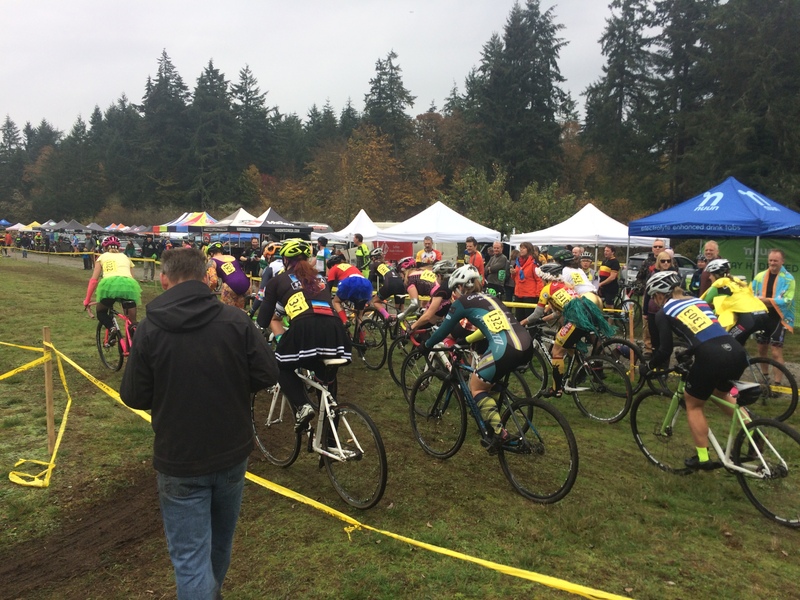 We had quite the adventure today, getting to the North 40 CX cyclocross race in Tacoma using our three bikes and three buses (and Pixie the dog in her dog packpack). I wouldn’t want to make a regular habit of this trip, but I’ll try anything once. My big takeaway was: there are lots of buses outside Seattle proper that only have two-slot bike racks. Uh oh. 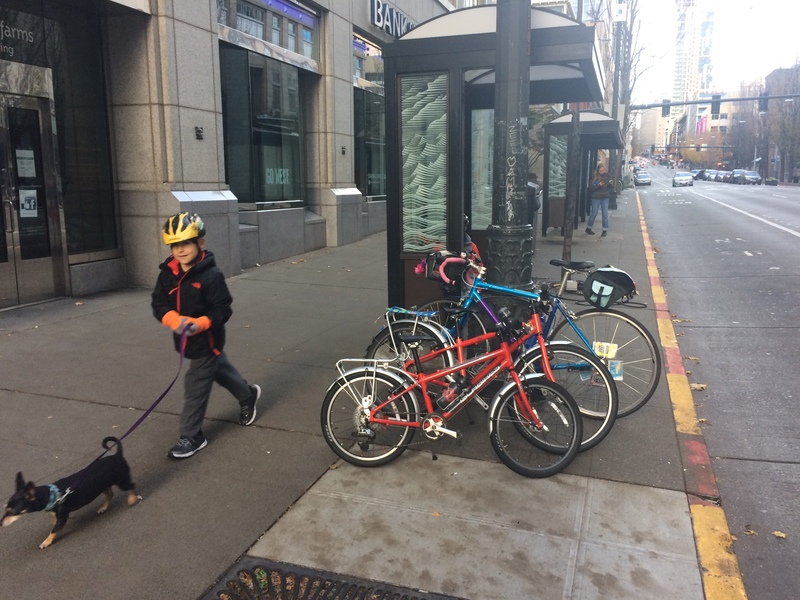 I considered taking the old mamabike (my city bike with one kid seat) so I could carry one kid and just deal with two bikes on the rack in case someone else was traveling with a bike on the same bus (mistakenly assuming there would be three slots), but the kids both wanted to ride and that bike is heavy. It’s gotta be less than the 50 pounds it weighed when it sported front and rear kid seats, but it’s still a pain to heft up onto the rack. So I took my road bike, 25-ish pounds, with rear saddlebag full of snacks and front bag full of books and toys (and more snacks). We didn’t really need bikes for the trip, what with crossing the street for the first bus, then going two blocks to get to the second bus, crossing a street to reach the third bus stop, and then traveling a handful of blocks to reach the race…but I knew the kids would have a lot more fun with their bikes along at the race, whether or not they wanted to do the kiddie lap (they didn’t, bummer) and I wasn’t sure what that last handful of blocks would be like. 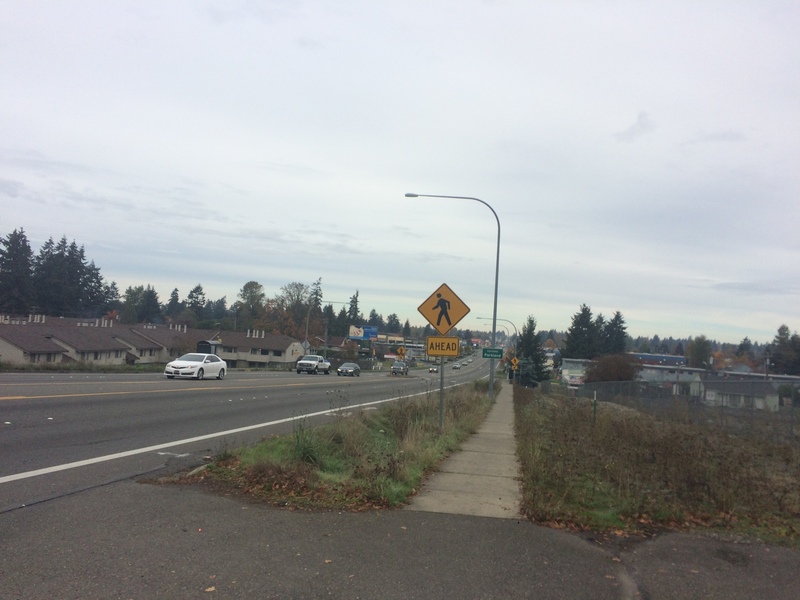 And when the kids didn’t want to cross four-lane Pacific at the Parkland/Spanaway border at a mere crosswalk, our ride turned into a mile with detour to a stoplight. Plus the streets off Pacific didn’t have sidewalks so it was much nicer to be on bikes than on foot. Our first bus was the 26 of the King County Metro system. As far as I know, all Metro buses have three-slot bike racks. I think they switched from two bikes to three bikes shortly after we moved to Seattle eight years ago. It was very quiet out and our bus ran early so while we waited to let the clock catch up the stop before our stop, I decided to hop off to double our downtown ride to four exciting blocks between bus stops. Our second bus was the 594 of the Sound Transit system. We take its sister, the 554, to Issaquah once a month for orthodontist visits and that bus always has a three-slot bike rack so I assumed the 594 would, too. Ho ho ho, it did not. I peeked in and told the driver we had three bikes and asked if we could bring the littlest one on board? He thought for a second and mentioned the next 594 was also the same type as his (the tour-bus-looking kind) and would also have have just two slots (I asked if some 594s are different bus types and have three slots and he said yes) so he said we could come aboard. Phew! And he carried the littlest bike on board himself and stowed it vertically in the seat pair behind him. Our third bus was the 1 of the Pierce Transit system. A new bus system for us! I figured the video on the website showing a two-slot bike rack might be an old bus so I Google image searched and thought the pictures I saw looked like three-slot bike racks and we’d be OK. Wrong again! All the Pierce Transit buses we saw had two-slot racks. But those racks had the old, easy-to-use metal hook arms. I know they aren’t as sturdy as the new yellow claws or the even newer black claws, but they are so much easier to use! The driver was unfazed by our extra bike and let me carry it onboard. And then let another guy carry his bike on board, too. And 2.5 hours later we were there! It wasn’t raining when we left home and the Seattle forecast looked dry so I under-dressed us for the Tacoma rain that kicked in a bit after we arrived. 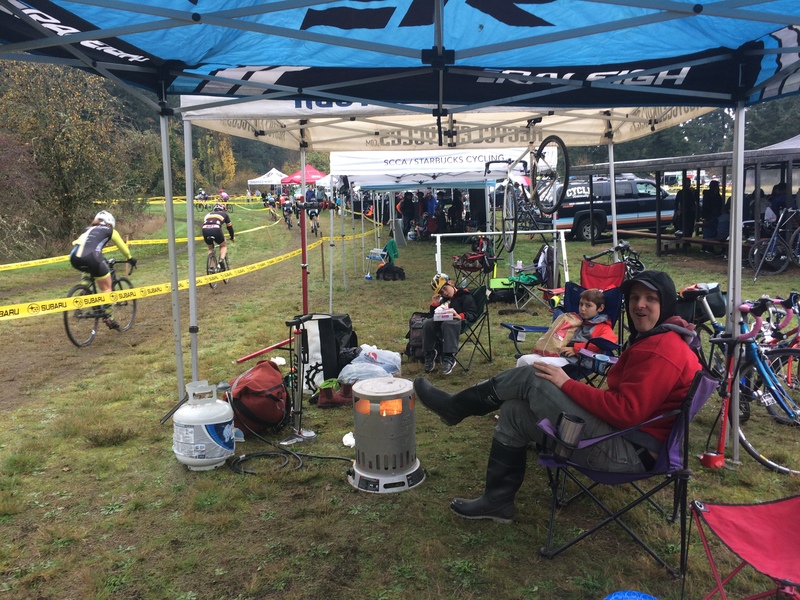 The kids still had fun and we hung in our Recycled Cycles Racing tent by the fire, with great view of the barriers, until it was my turn to work one of the course crossings. 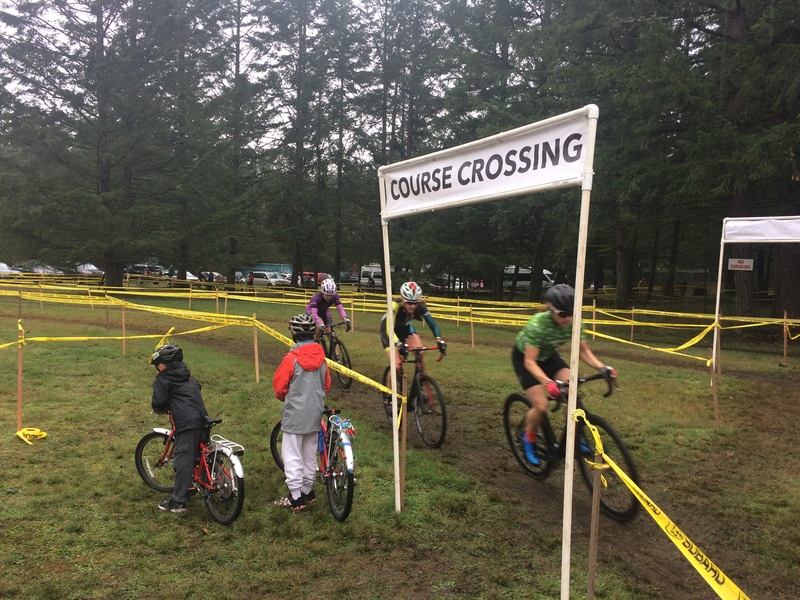 The kids tooled around on their bikes while the rain steadily increased…which I may not have really noticed were it not for the announcers repeatedly pointing it out. The kids had rain jackets and thin gloves, but no boots or rain pants. I had a wool sweater and cycling cap. Pixie was wrapped in a baby blanket in her backpack with her head poked out the side window. After an hour of that, we headed for the 1:44pm Pierce Transit 1 back to Tacoma. I had contemplated leaving my own bike in the team van so we’d only have two bikes to deal with, but I didn’t want to run after the kids to get to that first bus stop. Also, a teammate offered to drive us home if we left all three bikes in the team van, but we’d have to wait until after he cleaned up the course. Naturally, one kid wanted to do that and one kid didn’t. So I decided we’d try our luck with three bikes, hoping the 594s in the afternoon would be of the three-slot bike rack variety. And we were off to a good start: the 1 driver was cool about me bringing the littlest bike on board again. The 594, not so much. A bus with a two-slot bike rack pulled up at our stop and I asked about the bike and was given a firm no. Considering how knowledgeable the southbound 594 driver had been about bus types, I asked if the next bus would have three spots and how soon it came and he said he didn’t no the type, but it’d be half an hour. He said he’d call someone (shift supervisor, I think he said?) to come down and talk to me. Wow, really? 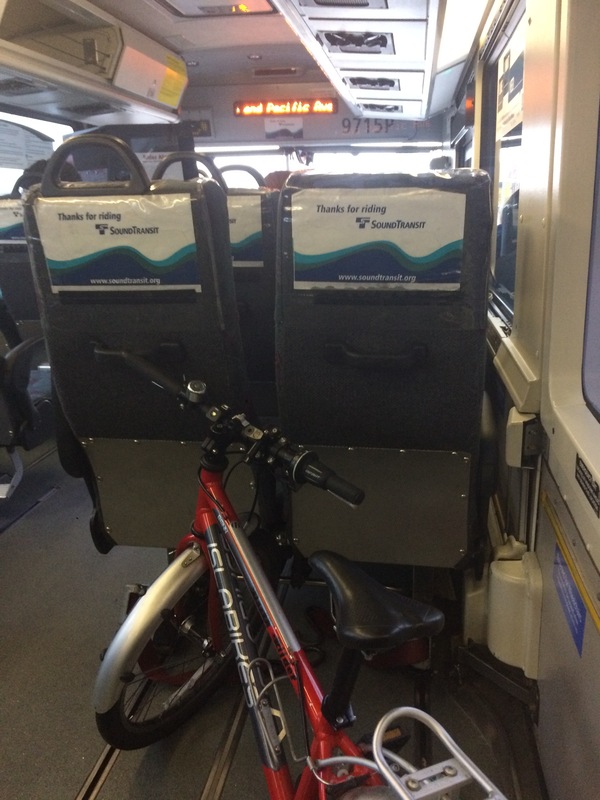 No one appeared to talk to me and I couldn’t tell from the next 594 driver’s poker face if he’d been warned about us, but he said we could bring the bike on board and put it in the mid-bus wheelchair spot. By the way, we watched a wheelchair load on a Sound Transit bus in the morning, drawing our attention to the mid-bus ramp and it’s really cool! Back in Seattle we could have biked all the way home. Of course one kid wanted to bike and one kid didn’t. I was partial to not biking uphill in the rain for close to an hour at kid speed so we biked two blocks to catch the 26 that takes us a two flat blocks from our house. And we got lucky–the 26 was running late so we only had to wait two minutes rather than 28 minutes for the one I thought we’d have to catch. And it had three empty bike spots for us on the rack. And 3.25 hours later we were home! Yeah, that’s a lot of time spent in transit on transit. But I should point out that the venue, Marymount Event Center/LeMay Family Collection, is hella far from home–50 miles away. Google maps says it would take an hour to drive there with no traffic so this was definitely longer than that (even with the rain, I don’t think there was traffic). I’d guess all three buses run more often on weekdays and the connections would have been quicker…but I’m too lazy to check. But mostly, it was a fun way to spend the day. We didn’t end up reading all together, though one kid read to himself for one bus. I also forgot about the toys they’d packed and they never asked for them. But we had a wonderful view, especially from our lofty tour bus seats on the 594. And after all this, only having to get to the Washington State Historical Society (where we transfered from the 594 to the 1) for Trainfest seems like a breeze! But we’ll do that without bikes.